View More In Potholders & Oven Mitts - Page 4. 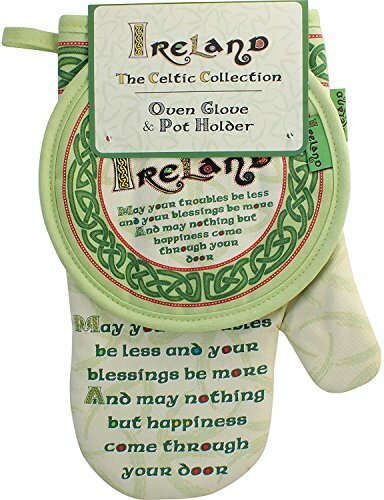 This pot holder and oven glove set is part of the Celtic collection. This is a great and practical accessory for your kitchen.The colours and intricate spiral edging are similar to those found in ancient Celtic artwork, such as the Book of Kells. It comes with and Irish Blessing.This is an excellent way of bringing some Irish charm to your kitchen. If you have any questions about this product by Carrolls Irish Gifts, contact us by completing and submitting the form below. If you are looking for a specif part number, please include it with your message.